If you would like to contribute any information to this county, please feel free to contact us. Are you interested in coordinating a county in KSGenWeb, contact theOrphan County Coordinator. 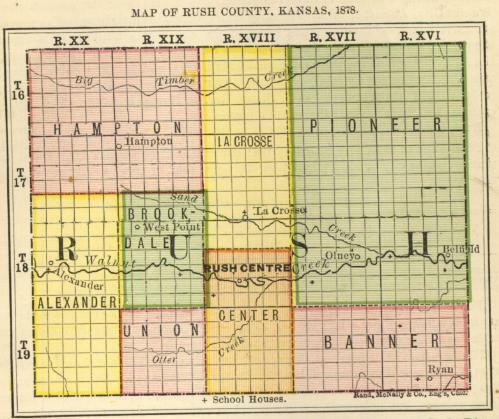 All links to Genealogy web pages for Rush County are welcome. Obit's, Bible Records, Family histories, ect. are welcome! They will be placed on the Rush County pages. Research queries may be viewed at Rush County Queries If you have information and time to help others search for their families please feel free to volunteer for the Rush County Lookups. As a volunteer you must have permission from the author or publisher of the book, or if the book is public domain no permission is needed. Those who are requesting information from volunteers, please only one question at a time. Volunteers may not live in Rush County so please do not ask them to "check out" places in the county. Please feel free to contact me at my e-mail address at the bottom of the page if you wish to volunteer. Thank you! Excerpts from McCracken, Kansas and Hampton and Big Timber Valley History Books. Golden Jubilee of German - Russian Settlements of Ellis and Rush Co.
* Schafer, Sr., Elmer J. If you have a WebPage that offers information on the Civil War and Kansas history e-mail me and I will be happy to place it onto the list. Anything from your ancestors that could help others in finding their lost links or even a new "relative" would benefit all who come to this page. I would like to thank all who contribute in helping others. Please remember it must state Rush County on your information or it will be deleted. limited use of the KsGenWeb Project. Permission is granted for use only on an official KsGenWeb page. Thank you for stopping by, come back again!